petit main sauvage: Climb on, climb up! Unfortunately for that, we were focussing more on bouldering than on taking pictures yesterday (I had a lot of fun doing that though). 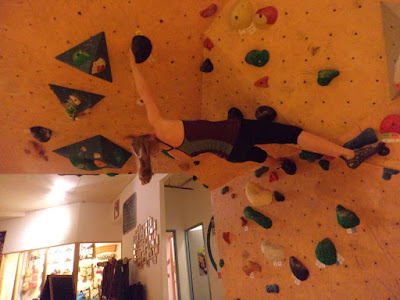 This picture shows my me-made sports clothes in action but it was taken in the corner of the climbing hall where the light is worst and we didn't take pictures anywhere else. 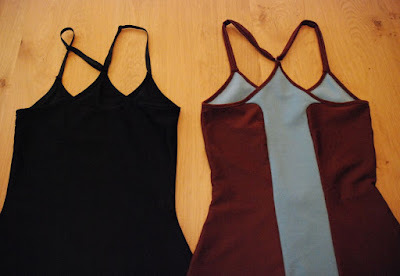 Last week, I started by making a plain and simple top with the back design I talked about before: Bra-style adjustable straps instead of the usual Y-back. I used fold-over elastic for the top edges and bra-straps, rings and washers for the straps. It fit properly but was a bit plain and, to make it possible to wear it without a sports bra, it would be nice to line the bust part. So, I sketched some colour block options and decided it would be great to make a climbing top with an arrow pointing up on the back panel. I kind of adjusted the rest of the design to that. The blue-ish material is a fairly plush sportswear material, the burgundy red is a fairly beefy lycra. Because the blue stuff is a bit thicker, I decided it might be fine in a single layer, even at the bust (although with a design like this, I could line it or even include bits of lingerie foam sewn to the lining). For the binding, I used strips of the red fabric. I cut them 10% shorter than the length they had to fit and serged them on, stretching to fit. Then I turned the strips over to the inside, zigzagged through all the layers and then trimmed away the excess fabric. I didn't have any matching lingerie elastic so I just made the straps from tubes of fabric. They are a bit softer than elastic straps and I just made them to fit. If I need longer straps in a couple of months, I'll just have to change them out for new ones. Based on my thorough testing so far, I have to say this top works well. It neither sags down nor creeps up and the materials are actually more comfortable than I had expected. I might try and make the arrow design a bit more obvious next time though, it doesn't really show the way it is now. There is more to try out, but this is a good start. 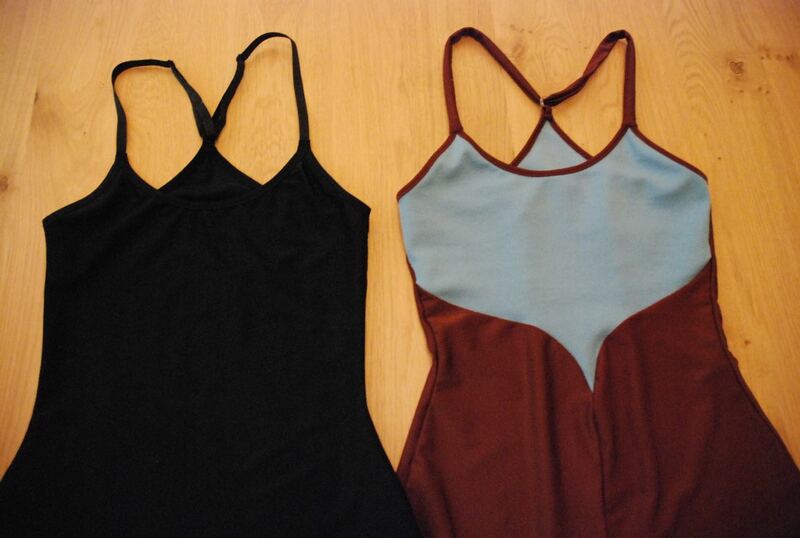 Nice work; I've always thought that athletic clothing was the one area where handmade was most difficult to achieve. Thanks for proving otherwise. They are likely ease movement a very nice! I also like sewing and climbing. This looks amazing. I just wanted to say that my daughters have had some sundresses with lingerie type straps over the years, and those little plastic rings do break after a while, with all the activity that little girls get up to. As this is of course also active wear, maybe it would be worth your while to source metal rings for future versions.